Dr. Amos B. Smith’s research interests include three diverse scientific areas: natural product synthesis, bioorganic chemistry and materials science. His scientific expertise in the total synthesis of complex natural products has allowed him to collaborate with many researchers across a variety of disciplines. One current collaboration is with NFCR-funded scientist Dr. Susan B. Horwitz¸ whose work focuses on combatting cancer drug resistance. Dr. Horwitz’s earlier research discovered the key attributes of Taxol®, a now widely used anti-cancer drug for treating breast, lung and ovarian cancer. She found that Taxol halts cell division by stabilizing the cellular building blocks known as microtubules. Intriguingly, Dr. Smith was the first person to synthesize and enable large-scale production of another microtubule stabilizing agent (MSA) called discodermolide—a natural agent that comes from a Caribbean Sea sponge. The two scientists combined their efforts and compared the results of discodermolide to those of Taxol. They found that discodermolide interacts with microtubules in a way that may complement Taxol and could reduce the resistance that many patients experience with Taxol. Dr. Smith has synthesized a library of the hybrid Taxol–discodermolide drugs, and Dr. Horwitz has found two hybrid candidates that could be promising new drugs. Additionally, Dr. Smith’s lab with non-naturally occurring MSAs includes the heterocyclic compounds triazolopyrimidines and phenylpyrimidines. The work holds considerable promise for the treatment of brain cancer, specifically the most deadly type of brain cancer – glioblastoma multiforme (GBM). The compounds being created penetrate the brain tissue and can be taken orally (unlike more than 95% of all molecules). Dr. Smith, in collaboration with Dr. Horwitz and other scientists, will elucidate how these compounds stabilize microtubules to set the stage for the development of a potential new treatment for GBM and other central nervous diseases. Amos B. Smith III, Ph.D., received his Bachelor and Master’s degrees from Bucknell University and his Ph.D. from Rockefeller University, where he was also an associate from 1972-1973. 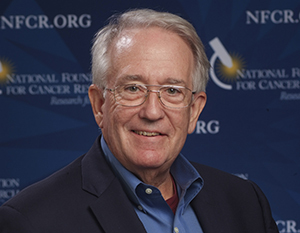 In addition to his fellowship with NFCR, Dr. Smith is a fellow of the American Academy of Arts and Sciences and member of the ESPCI ParisTech Scientific Council. Dr. Smith’s laboratory has prepared more than 90 natural products possessing significant bioregulatory properties to date and his research achievements have been reported in more than 500 peer-reviewed publications. In 2015, Dr. Smith was awarded the Royal Society of Chemistry’s Perkin Prize for Organic Chemistry. Your ticket for the: Amos B. Smith III, Ph.D.